Welcome to the home of the Burpham Community Association (BCA) - we represent the community of Burpham, Guildford. Our site is designed to provide all the information on the latest news, events, community issues, and history of our village, as well as insight into what the BCA and our members are currently working on. Burpham has a vibrant, active community and we'd love for you to join and get involved. Not yet a member? Just fill in your details below to get in touch, at just £8 per household or £4 per individual. We're also looking for anyone can volunteer their time, from helping run an event or providing expertise on the big issues that affect us all from flooding to planning. Do you worry about the impact the heavy traffic through Burpham has on air quality? 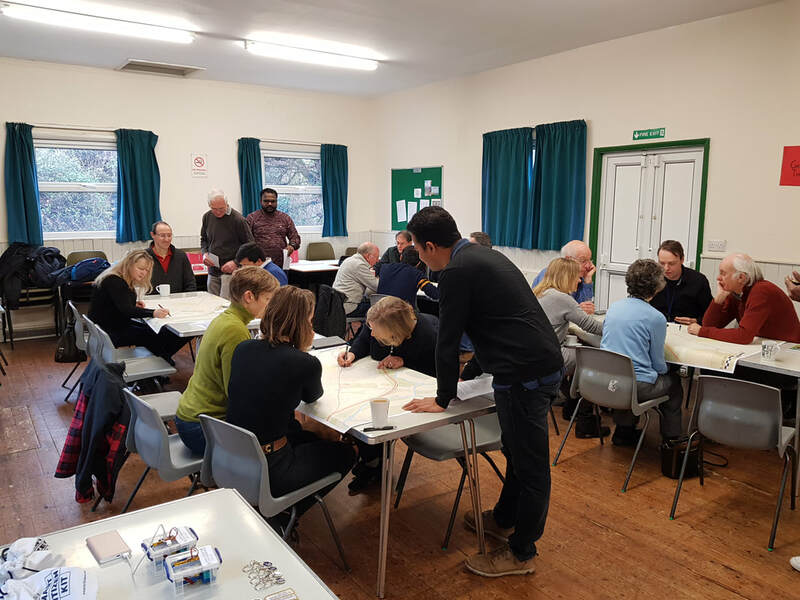 The Burpham Community Association (BCA) has been working with Professor Kumar and his Global Centre for Clean Air Research team at Surrey University and we have already recorded some interesting results. We hosted a workshop on air pollution on Saturday 12th January in the Village Hall. It started with a very informative presentation from Professor Kumar on the different kinds of air pollution and the effects they can have. Then we looked at ways we can mitigate the damage. Thanks to Professor Kumar and his fantastic team from Surrey University GCARE team for such an interesting morning. Tony and Hazel Teal may have retired from the BCA Committee but they will stay on as co-opted members. They have given a great deal to the community over the last ten years. Members said a heartfelt thank you at our Social Evening last December by presenting the Teals with G Live and Garden Centre vouchers – many thanks to all those who contributed, and a huge thank you to Tony and Hazel for their enormous contribution to Burpham and our community. We're delighted that you can now pay for your BCA subscriptions online! It takes one minute to complete the Direct Debit form, and then you're set up and ready to go. Join the BCA on Facebook & Twitter! The BCA is now on Facebook and Twitter. We'd love for you to join the conversation! Available for members and non-members alike, it's a great way to stay up to date with everything that's happening in our community. The Guildford Community Lottery was launched in December 2018 as a way for everyone to support local causes and be in with a chance to win prizes up to £25,000. 50% of all tickets sold from our page go to the BCA! Tickets only costs £1 per week so click here to buy yours now! Support the community and you could win a family ticket for the Surrey County Show on 27th May! Buy one or more tickets before Saturday 11 May 2019. Each ticket gives you a chance to win...so more tickets mean more chances to win! Click here to find out more about the village, our history and the community. Find out here about who the BCA are and what we do for our members. Read up about the latest news affecting Burpham. Read the notes here from Richard Cant, the National Trust Stoke Lengthsman, on the latest developments on the Wey. Read the official response from the BCA on this very important consultation by Guildford Borough Council. We are always keen for new members, so that we represent everyone in the community and can continue our activities. Find out how to get involved. Moira MacQuaide Hall is writing a book on the history of Burpham village and would love to talk to people who have lived here over the last fifty years or more. She has done a lot of research on the facts but feels it is the personal memories that local residents share that make the story come to life. If you remember events or people in the village, or have photos that might be interesting then please contact Moira. This can be either by phone on 07963 756543 (leave a message or text if she doesn't answer) or email Moira.macquaide@gmail.com and she will get back to you. Looking for the old BCA website? You can still see it, just click here. You can read our GDPR and Data Protection Policy statement here.